Freddie is a highly successful stage, cabaret, close up and children’s magician. He has been performing magic professionally for the past 15 years entertaining thousands of people along the way. Freddie’s talents have been widely recognised over the years and have won him many awards and competitions. He was elected the president of the Guild of Magicians; the youngest and longest serving president in its 70 year history. Freddie has established a great reputation around the counties as a leading children’s magician, enjoying many repeat bookings at private parties, fêtes, schools and theatres. His friendly personality and interaction with the children at their level are just a few of the things that make him stand out in his field. At birthday parties all of the children get to help with the magic. However, the birthday child will be the star of the show and will be made to feel extra special, as they are transformed into a magician themselves by producing a live rabbit and dove. They receive a special birthday gift; the other children also get prizes for participating in the show. It’s not just the children who get to have all the fun though; Freddie’s magic will entertain, dazzle and surprise adults too. For adults Freddie can also provide cabaret and close up magic at private and corporate events. 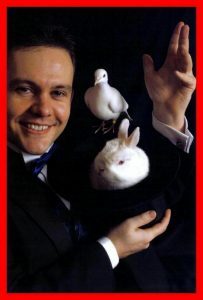 These shows consist of traditional and modern magic, with comedy and audience participation throughout. With a vast experience of professional engagements behind him Freddie enjoys success at various Theatres, Clubs, Hotels and Restaurants. Consequently Freddie’s magical talents are in high demand. Freddie is CRB checked, fully insured and a member of Equity. He can cater for all ages and events be it indoors or outdoors. He is fully self contained and provides all his own equipment; you need not worry about a thing. You can choose from a 30 minute, 45 minute, 1 hour, or a series of magic shows throughout the day. Whatever the celebration, wherever the venue, Freddie can add a little magic to any occasion. Please feel free to phone or email for full details and prices and to book early to avoid disappointment. Freddie looks forward to hearing from you. The Opera House, Blackpool; The Royal Concert Hall, Nottingham; The Palace Theatre, Newark; The Bonington Theatre, Nottingham; The Palace Theatre, Mansfield. BBC Radio Nottingham, Boots, Tesco, Sainsburys, Morrisions, Marvin’s Magic, Linc’s FM, Channel 5, Sheffield Utd, Mansfield Town FC, The Women’s Institute. Various charity shows in aid of, The British Institute for Brain Injured Children, Mencap, Rainbows, Salvation Army, Skylarks, Nottingham Respite Care, Nottingham Hospice, Chernobyl Children and other charities around the region. School shows in the Nottinghamshire, Derbyshire, Leicestershire and Lincolnshire region.